Parent et al examine the risk for perinatal complications in women with a history of bariatric surgery by comparing them with mothers without operations and examining the association of the operation-to-birth interval with perinatal outcomes. It was found that the infants of mothers with a previous bariatric operation had a greater likelihood of perinatal complications than the infants of mothers without. Operation-to-birth intervals of less than 2 years were associated with higher risks for prematurity and neonatal intensive care unit admission. Postoperative pulmonary complications (PPCs), a leading cause of poor surgical outcomes, are heterogeneous in their pathophysiology, severity, and reporting accuracy. Fernandez-Bustamante et al prospectively studied clinical and radiological PPCs and respiratory insufficiency therapies in a high-risk surgical population. 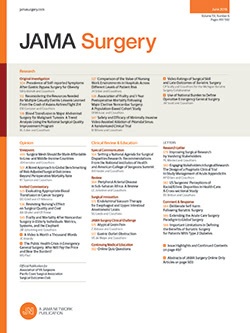 Their multicenter prospective observational study included patients who underwent predominantly abdominal, orthopedic, and neurological procedures and found that even mild PPCs are associated with increased early postoperative mortality, intensive care unit (ICU) admission, and length of stay (ICU and hospital). There is limited literature reporting circumstances surrounding end-of-life care in vascular surgery patients. In this cohort study by Wilson et al, medical records were reviewed for all vascular surgery patients at a tertiary care university hospital who died during their hospitalization. Of 111 patients, 15 had an advance directive, and 28 had a palliative care consultation. In high-risk patients, discussions regarding extended stays in the intensive care unit, prolonged ventilator management, and possible dialysis and tracheostomy should be communicated with patients and families at time of hospitalization and advance directives solicited. Studies demonstrate that use of prostate-specific antigen screening decreased significantly following the US Preventative Services Task Force (USPSTF) recommendation against prostate-specific antigen screening in 2012. Halpern et al determine downstream effects on practice patterns in prostate cancer diagnosis and treatment following the recommendation and found that prostate biopsy and radical prostatectomy volumes decreased significantly. Scarborough et al describe a method for estimating the effect of specific complications on clinical and economic outcomes after elective colorectal resection. They found that anastomotic leak, ileus, pneumonia, and bleeding are the complications with the greatest effect after colorectal surgery. Conversely, many complications that are currently targeted by national quality improvement initiatives have little or no effect on the outcomes of this patient population.